New Horizons will arrive at Jupiter on February 28, 2007, and at Pluto on July 14, 2015. 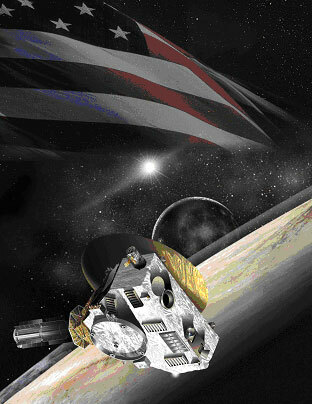 New Horizons is nearing completion of its second week in flight, and all continues to go well. As Project Manger Glen Fountain is proud of saying, New Horizons is now safely away from Earth, in the cold vacuum she was born to thrive in. 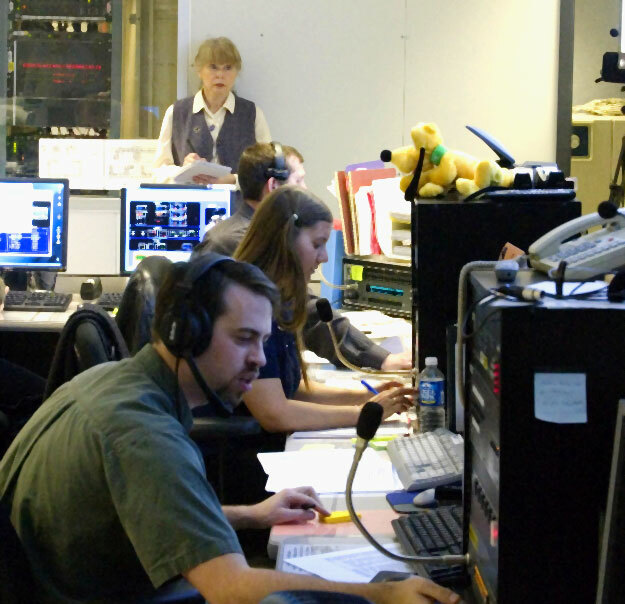 In the past week, our spacecraft team, led by Alice Bowman and Nick Pinkine at the Johns Hopkins Applied Physics Laboratory, continued their checkouts of spacecraft subsystems, and conducted Trajectory Correction Maneuver (TCM) 1 with great success. As a result, the error in New Horizons' trajectory, which was already small, has been reduced by a factor of almost 20! The purpose of TCM-1 was both to commission our propulsion system for trajectory changes, and to null out launch injection errors. Fortunately, our launch was so accurate that only about 40 miles per hour of trajectory change needed to be made; this is less than one quarter of our post-launch trajectory correction budget. Compare that 40 miles/hour number to our 36,254 mile-per-hour exit from Earth, and you'll see just how fantastic a job our Atlas V/STAR-48 launcher did. This allows us to bank the difference in fuel as savings for future Jupiter, Pluto and Kuiper Belt Object encounters. TCM-1 was split into two parts, called 1A and 1B. TCM-1A was a 5 meter/second test and calibration firing conducted on Saturday, January 28; TCM-1B was a 13.3 meter/second maneuver conducted on Monday, January 30. Both maneuvers were successful. We plan to trim out the small (about 4%) residuals from the two TCM-1 burns, and to correct to the much better orbit solution we will have from another couple of weeks of tracking by the Deep Space Network (DSN) in TCM-2. This burn, which is likely to be the smallest of the three post-launch maneuvers, is scheduled for Wednesday, February 15. TCM 1A and 1B were conduced "open loop," by pointing the spacecraft in the correct direction for the burn, stabilizing it like a spinning top, and making a timed burn. In contrast, TCM-2 will be conducted in "closed loop" fashion, with the spacecraft three-axis stabilized and using its onboard gyros in the loop to cut the burn off when the precise targeted velocity change (Delta V) is achieved. As such, TCM-2 should produce an even closer-to-spec burn than TCMs 1A and 1B. As you can see, we wanted to "walk before we ran" in terms of TCM complexity, which is why TCM-1 used the simpler but less accurate technique described above. As we gain flight experience with our spacecraft, we are coming up the learning curve and seeing some of its idiosyncrasies. This is something all spacecraft teams benefit from in early flight. For example, careful tracking has shown that New Horizons is still slowly outgassing some absorbed water it took on during its construction and testing on Earth. This outgassing produces tiny puffs of gas from time to time, particularly when a spacecraft surface that has only been in shadow is exposed to sunlight, which vaporizes the water in it. Although the forces at work due to water vaporization events are incredibly tiny, less than 10-7 Gs, we are able to detect them from tracking data. Another idiosyncrasy we are seeing is a few radiation-induced single-bit upsets in the spacecraft memory each day. Although these are occurring at a somewhat higher than predicted rate, they are no problem and are corrected automatically onboard the spacecraft when it does its once-per-minute memory scrubs. 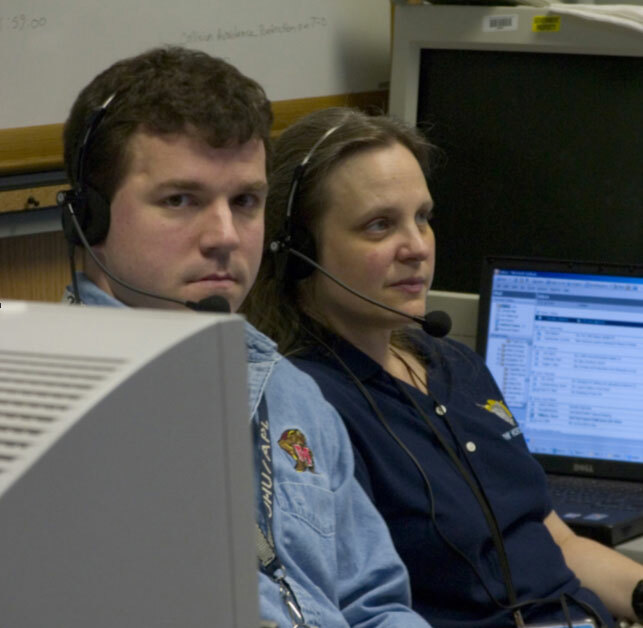 New Horizons Mission Operations Manager Alice Bowman (right) and Deputy Mission Ops Manager Nick Pinkine (left) on launch day in the New Horizons Mission Ops Center (MOC) at APL, in Laurel, Maryland. 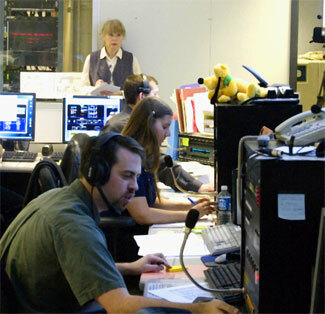 New Horizons Flight controllers at work in the MOC at APL. For those of you interested in the question "Where is New Horizons?" -- our Web site now has a feature (found here) that gives you both graphical location and trajectory displays, some distances to Earth, Jupiter, and Pluto, and other information too. As I write these words, the spacecraft has just passed the 12-million kilometer range from Earth. Enjoy! For those of you interested in our now-derelict third stage, we decided not to include it in the "Where is New Horizons?" feature, but I can tell you that orbit extrapolations tell us that our third stage is now about 15,000 kilometers from New Horizons. By the time it reaches Jupiter, the defunct stage will be about 400,000 kilometers away from our spacecraft. Owing to it missing the Pluto aim point at Jupiter by this amount, the third stage will miss Pluto by about 200 million kilometers — which is about as far as the average distance from the Sun to Mars. Finally, for this week, I'll remind you that this coming Saturday (February 4) will be the 100 th anniversary of Clyde Tombaugh's birth. I'll be helping Clyde 's home state, Kansas, celebrate that occasion with some events in Lawrence, Kansas, this weekend. If you have a moment to reflect on this when Saturday comes, give some thought to the fact that Clyde's hard work resulted in the discovery of not just a new planet, but also the Kuiper Belt, and with it, a huge and unexpected new piece of the geography of our home solar system.